Wow...stereotypical much? A headdress, tomahawks, a tipi, feathers, warpaint, and arrows. The first three have nothing to do with Arizona's Indians and are thus false as well as stereotypical. And as Adrienne Keene tweeted:Not to mention the whole "angry warring Indian" vibe when it's an article abt a legislative disagreement. #stereotypesarerealyallExactly. To understand the problem, imagine a comparable image: Obama and Republican House members in cowboy gear shooting guns at each other. Such an image might exist, and might tell us something about legislative politics. It wouldn't necessarily be offensive. But most non-Native conflicts are not framed as murderous warfare with lethal weapons. And most Native conflicts are so framed. If you went solely by the images, you'd conclude that Indians are much more likely than non-Natives to resort to physical violence. This image contributes to the ongoing vilification of Indians as brutes and barbarians. It's not only stupidly stereotypical to (mis)use Indian motifs from other regions. It's stupidly racist to single out Indians for the "savage" treatment. Clearly, your artists and editors have very little insight into or concern for the realities of tribal life in 21st century America. 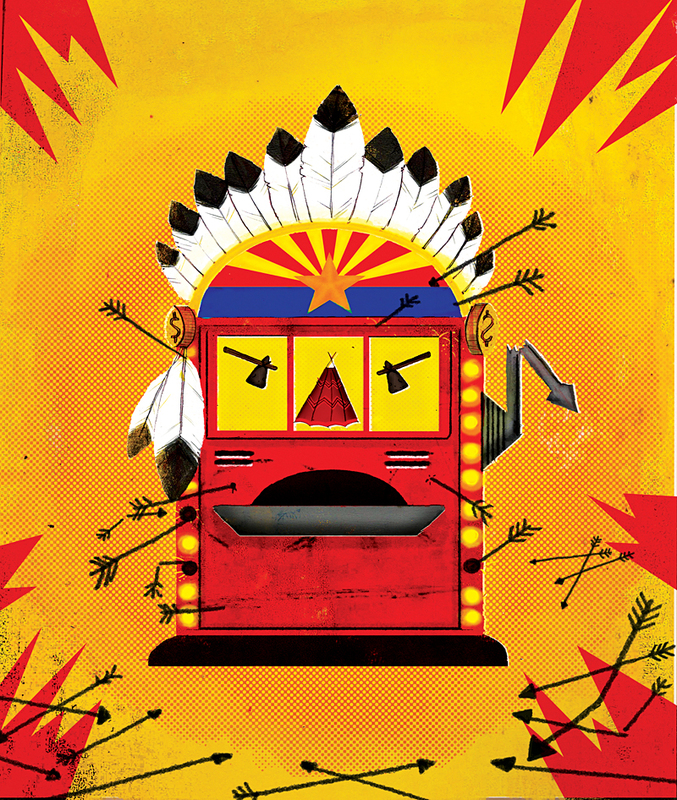 From your cover illustration’s inclusion of tomahawks, arrows, a teepee and a feather-decorated slot machine to its offensive use of a stereotypical headdress to sell “an Indian story,” New Times’ cover reduces ours and other Arizona tribes’ culture to and age-old Hollywood oversimplification of what it means to be American Indian.